SO I have no intention of ever reading the Game of Thrones books; not out of a sense of I'm-too-good-for-it, but rather, Who-has-the-time? But I was curious about Martin's style, so I have been meaning to get this book for a while now. Fevre Dream is a vampire story, which is much more up my alley than chain-mail-clad sword-brandishing fantasy, anyway. Written in 1982, this book is what one might call steampunk science fiction. Summary: It is the story of a steamboat captain named Abner Marsh who is commissioned to construct a new boat by Joshua York, a strange beautiful gentleman and businessman who wishes to be his partner. The magnificent new steamboat is called the Fevre Dream and it is Abner Marsh's dream to make it the fastest running vessel on the Mississippi. Part of Abner Marsh's contract with York is to stay out of his away, no questions asked about York's nocturnal habits or the strange company he keeps. Abner Marsh is more than eager to accept York's conditions for the chance to captain his dream boat. That is, until he begins to discover a strange pattern to York's secrets. A rumour floats upstream... vampire. Meanwhile, in a small settlement along the Mississippi lies a haunted house. A house inhabited by such monsters that no slave is ready to work there, no guest returns alive. The property is run by Damien Julian, who calls himself the bloodmaster of his clan. As the neighbouring town turns against the demonic presence in their house, the ancient Damien Julian sends out his clan to find accommodation elsewhere. And a couple of them just happen to board the Fevre Dream. "The very one, Abner. An astounding man. I had the good fortune to meet him once. Our steamboat put me in mind of a poem he once wrote.” York began to recite. "What shall we name her?" York asked, his eyes still fixed on the boat, and a slight smile on his face. Does the poem suggest anything? I had in mind something like Dark Lady, or—"
"I had somethin’ in mind myself," Marsh said. "We’re Fevre River Packets, after all, and this boat is all I ever dreamed come true." He lifted his hickory stick and pointed at the wheelhouse. "We'll put it right there, big blue and silver letters, real fancy. Fevre Dream." He smiled. For a moment, something strange and haunted moved in Joshua York’s gray eyes. Then it was gone as swiftly as it had come. "Fevre Dream," he said. "Don’t you think that choice a bit... oh, ominous? It suggests sickness to me, fever and death and twisted visions. Dreams that... dreams that should not be dreamed, Abner." My thoughts: To me, a well written speculative fiction contributes to the existing lore, offers an alternate. (To me, for instance, the 'vampires don't come out in the sun as they sparkle and stand out' bit of the Twilight series is the least of its faults because of its sheer innovation. Did anyone ever even consider that the sun did not in fact harm vampires directly but made them more conspicuous?) 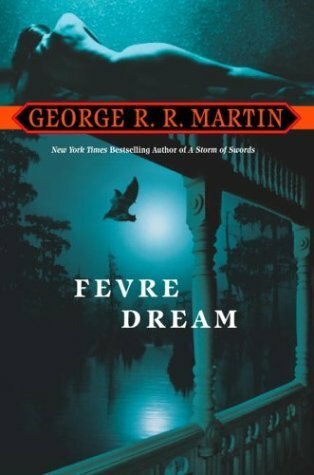 In this aspect of lore-feeding, Fevre Dream by George R.R. Martin fares rather excellently. The vampires of Fevre Dream are not supernatural, but rather a distinct race - humanoid yet different. A race afflicted by a thirst which might just find itself a cure in science. The popular vampire myth is steeped in Christian ritual. The vampire is a reanimated corpse that rests in its coffin, leaves it at dusk, can be repelled with the cross, may not enter a church, gets burnt by holy water. Take all that away and what is left may not be a vampire at all. Hindu mythology speaks of batlike demon creatures but they bear only a vague resemblance to our walking dead. Like all recent vampire mythology, Martin's story is a fight of good versus evil. It is also very Christian, but in a different way. Martin tells the story of Joshua York as a messiah come to free the vampires of their curse, the Pale King come to lead them to a newer tomorrow. On a more meta-level, Martin's story is a fight between the popular contemporary myth and the old darker one. I have heard of Martin writing morally ambiguous characters. Here, however, there is a clear black and white, which serves its (unintended?) purpose. On the one hand, you have Joshua York, beautiful and alluring, leading a civilized life and on the other, Damien Julian, blood master, a frightening creature wrought with pure evil and destruction. The vampire myth has adapted itself to the needs and likes of every generation and Martin's story tests our allegiance. It does not leave you with a satisfying ending, but rather, drags you along till you make a choice - which is more enduring? The tragic prince-turned-Beast or the terrible monster? I chose the latter. Abner March, loyal to the end, remained alongside the beautiful and tragic Joshua York; the perfect friendship. Fevre Dream is engaging; a surprise, for its size is tremendous. Martin's lengthy descriptions of characters and their physical appearances bored me. Literary references abound, with Shelley and Byron being particular favourites of Joshua York. But the atmosphere of steamboat racing, breaking the chains of slavery, bubbling invention is a fantastic capture. The writing loses its way sometimes, gives in to gimmickry, but on the whole, it pulls you in. I have been chewing on this review for a long time, and one thing is clear, the book has left an imprint on my thoughts, if not always a positive one. Accidentally slitting my hand on a knife yesterday may have played a major part in pushing my opinion in favour of Martin's book; the uncaring spillage of blood in modern vampire stories, its supposed beauty, now brings a particularly bitter taste, and having a young man or woman lust sacrificially after the metaphorical knife seems plainly objectionable. Dracula makes more sense than Prince Lestat, and Fevre Dream lets you pit one against the other.